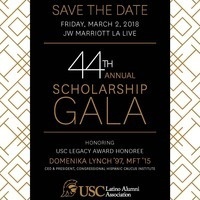 The USC Latino Alumni Association cordially invites you to its 44th Annual Scholarship Gala on Friday, March 2, 2018, at the JW Marriott LA LIVE. We hope you will join us for this outstanding yearly event that celebrates our alumni and the extraordinary Latino students we support. For reservations, please call Dolores Sotelo at 213 740-4735.